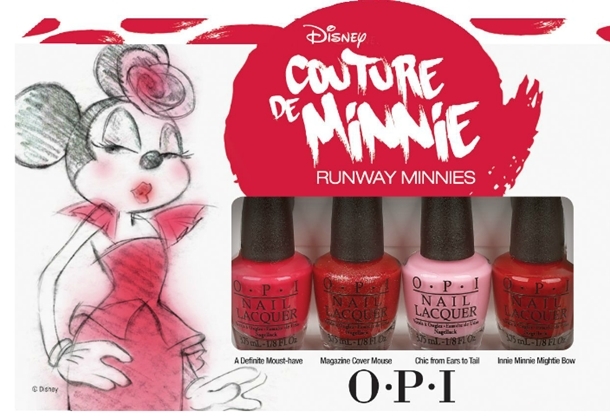 After the amazing success of last years Vintage Minnie Mouse collection, OPI releases a new Summer 2013 collection called Couture de Minnie. This new collection features five new shades inspired by our favorite mouse. We’re really excited to share this exclusive news with you! Let’s take a look! OPI Chic from Ears to Tail – This pop of bubblegum pink is totally fabulous! OPI A Definite Moust-have – This fantastic fuchsia is at the top of my shopping list. OPI Minnie Style – This white and red glitter is the height of fashion. 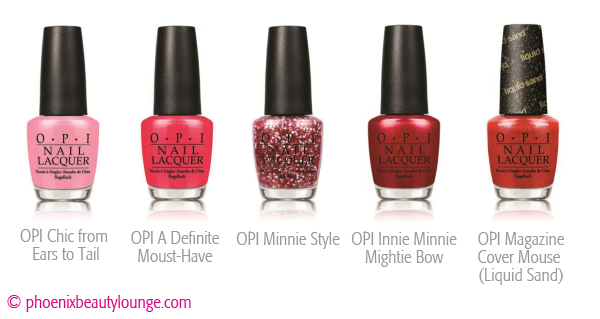 OPI Innie Minnie Mightie Bow – Catch this crimson by the toe! OPI Magazine Cover Mouse – The headline-making strawberry has sparkling texture. Five new beautiful OPI Minnie Mouse shades! We love the fuchsia pink and white glitter polish, OPI Minnie Style. And the magenta Liquid Sand finish, OPI Magazine Cover Mouse, looks great too! We can’t wait to get our hands on these pretty pinks. OPI Chic from Ears to Tail and OPI A Definite Moust-have look like the perfect bubblegum pink and hot pink creme. And it looks like we can spot some beautiful pink shimmer in OPI Innie Minnie Mightie Bow. We’re digging it! OPI Couture de Minnie is available to order now on our site, Phoenix Beauty Lounge. What do you think of this new OPI collection? Any shades you can’t wait to get your hands on? Let us know in the comments! This entry was posted in Collection previews and tagged nail polish, new opi, new opi collection, opi, opi couture de minnie, opi minnie mouse, opi nail polish by phoenixbeautylounge. Bookmark the permalink.